In 1945 Donald Mitchell Healey, a very capable auto engineer and successful racing driver, founded the Warwick based Healey Motor Company. 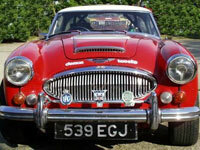 But the history of the Austin-Healey Marque really started in 1952 at the Earls Court Motor show in London. Donald Healey was showing his latest model there, which was known as the Healey Hundred. It featured a sleek 2-seater sports body and was powered by a 2.6 litre 4-cylinder Austin engine. It attracted a great deal of interest not just from the public, but as legend has it also from Sir Leonard Lord of Austin who needed a sports model to meet impending new competition from rivals such as MG and Triumph. An arrangement was made between the two men, and the car was put into production at Austin's Longbridge factory. It was sold as the Austin-Healey 100. It is now more widely known that talks between Leonard Lord and Donald Healey had occurred earlier than the 1952 show, and that discussions of a possible deal between them were mentioned when Donald Healey had arranged to use Austin running gear for his car. The 100 did very well in motor sport which was then, as it is now very good publicity for a car manufacturer, and sales were good. This same car was later fitted with a six cylinder engine and became known as the 100 Six and after further development ultimately became the Austin-Healey 3000 - now widely acknowledged as being the one of the greatest British sports cars of all time. Production of a small sports car, the Austin-Healey Sprite began in 1958, and this was powered by the BMC A series engine. The Sprite proved to be extremely popular and became fondly known as the Frogeyed Sprite due to the positioning of the headlamps which protruded above the low bonnet to meet lighting regulations. Austin-Healey went on to produce cars right up until 1972 when the 20-year agreement between Healey and Austin came to and end. Donald Healey left the company in 1968 when the British Motor Corporation (Austin had merged with Morris in 1952 to form BMC) was taken over by British Leyland. Donald Healey became Chairman of Jensen Cars, and was later awarded a CBE. Donald Healey died in January 1988 at the age of 89. The Austin-Healey 100 was the car that introduced the Austin-Healey Marque. This very British sports car used an Austin A90 engine and modified Austin A90 gearbox, and its all-steel body was mounted on a steel box section chassis. In October 1956 after great success with the 100/4, Austin-Healey announced the arrival of the new 100/6. This car was very similar in appearance to the 100/4, but his time the car was fitted with a tuned version of the six cylinder BMC C series engine. The Austin-Healey 3000 was launched in June 1959 featuring several improvements over its predecessor the 100/6. These included an increase in engine capacity from 2639cc to 2912cc, Girling front disc brakes, adjustable front seats, and wire wheels as standard. The Austin-Healey Sprite was launched in May 1958 as an affordable and economical sports car, and first went on sale at a price of £669 - slightly less than a Morris Minor deluxe saloon of the same time.